Rhino Ark was founded in 1988 by Ken Kuhle in response to the grave crisis facing Kenya’s black rhino population. His vision was to build an electric fence around the Aberdares mountain range. That vision became reality in 2009 when the 400km electric fence was completed. It brings harmony between wildlife inside the fence, and farmers outside it who can sleep at night not fearing land, crop and house destruction. The result is that the Aberdares has gone from being an eco-disaster to a thriving mountain eco-system whose flora and fauna is healthy and diverse, including elephants, rhinos, leopards, mountain bongo and water buffalo. It is also the water table for Nairobi and thus the project has ensured a clean water supply to Kenya’s capital. In 2010, Rhino Ark announced its formal commitment to supporting conservation of other mountain forest eco-systems. Its focus is now on building a 450km electric fence around Mount Kenya (designated as a World Heritage website by UNESCO in 1997) and the Mau Eburu forest. 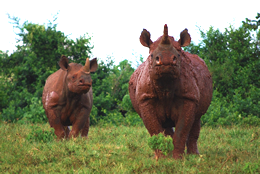 Rhino Ark (UK) is the UK arm of Rhino Ark Kenya Charitable Trust. We help to develop sustainable solutions to the challenges facing mountain forest eco-systems and threatened biodiversity areas. Everyone who works for Rhino Ark (UK) is a volunteer. We have no overheads so, other than specific London Marathon costs, your money goes to Rhino Ark Kenya; their costs are paid for by Kenyan events. So if you were to raise £5,000, then c.£4,500 (i.e. minus Marathon entry costs etc) would go straight to Kenya to build an electric fence. One metre of fencing costs £15.17, so your sponsorship would build 300m of fence. How cool is that!